Honoring Augusta-CSRA Vietnam War Veterans for their courage, sacrifice, and dedication. The Vietnam War Memorial Initiative’s objective is to honor all Augusta-CSRA Vietnam War Veterans, living and deceased, who were willing to sacrifice everything for our freedoms and liberties, by placing a permanent memorial to their service and sacrifice in downtown Augusta, Georgia. The Vietnam War was the longest U.S. conflict of the 20th century and one of the most intense wars the United States ever fought. Many of these brave men and women were grieviously injured, others suffered as prisoners of war, and many never returned. We can never repay them for their sacrifice, but we can honor their lives, the lives of their loved ones, and their memories by providing a meaningful tribute to their service and sacrifice. Please help bring this vision to life by making a contribution to the VWMI. 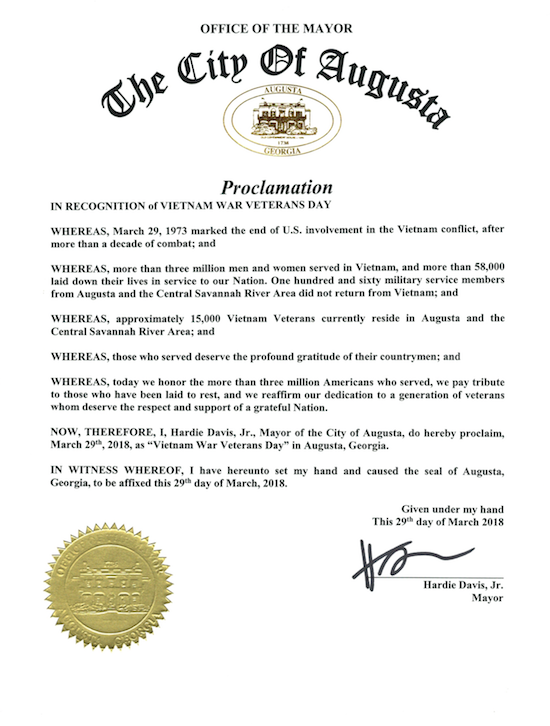 Augusta, Georgia and the Central Savannah River Area (CSRA) contributed more than 15,000 of their sons and daughters to the war in Vietnam – 169 of those service members made the ultimate sacrifice for our Nation and never returned. This memorial seeks to honor those who died and those who valiantly served. The total count of U.S. military casualties in Vietnam and bordering nations was 58,221. The 58,221 casualties include 1,325 servicemen who were POW/MIAs. There were 262 Medal of Honor recipients stemming from action in the Vietnam Theater of Operations. Enlisted men and women account for nearly 87% of all U.S. deaths that occurred in Vietnam. More than 900 service members died on their first day in Vietnam. More than 1,400 died on their scheduled day of departure from Vietnam. 16 clergy members died in Vietnam, including two Medal of Honor Recipients. 8 female service members died in Vietnam – all nurses including Lt Col. Ruth Ann Graham, a veteran of World War II, Korea and Vietnam. 31 sets of brothers and 3 sets of fathers and sons were killed in Vietnam. 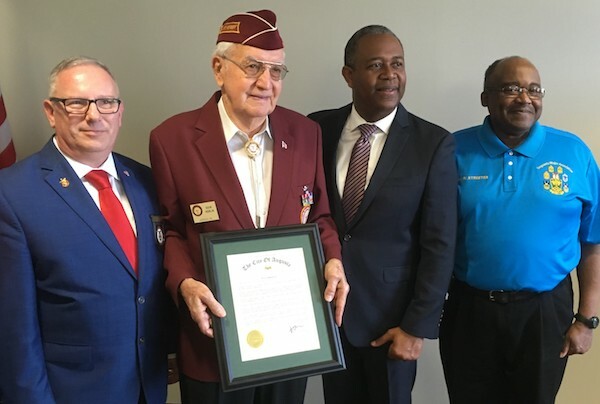 Mayor Hardie Davis, Jr. declaring National Vietnam Veteran’s Day in Augusta, Georgia, March 29, 2018.